A homeowner and his wife had to be rescued from their home after it collapsed around them. They say their cat helped save their lives. NBC10's Steven Fisher has the story. A couple's feline and good Samaritans are credited with helping save them from serious injury or death when their West Philadelphia home crumbled around them early Wednesday. Baxter the cat began scratching the homeowner around 4:30 a.m. as he slept on a couch inside the S. Ruby Street home he shares with his wife. The nudging forced the man to get up and follow the tubby gray and white shorthair into another room. Meanwhile, upstairs in a bedroom, the man's wife heard the commotion and then a large creak coming from the rowhome. She began making her way downstairs when a load-bearing southern wall collapsed, firefighters said. 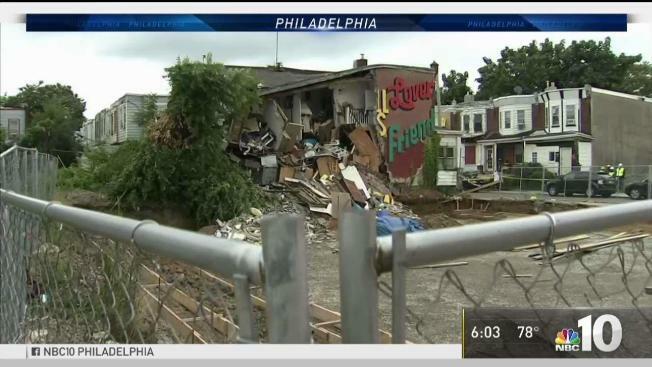 Baxter the cat is credited with warning his owners about the impending collapse of their West Philadelphia home. As the south side of the house came tumbling down onto an adjacent vacant lot, the woman went with it, becoming trapped on the steps. A group of friends coming home from a night at the casino heard the woman’s calls for help and rushed to rescue her. 5 Hurt as Car Collides With Horse-&-Buggy in Pa.
“We heard the lady screaming and she was stuck in between the banister and the wall that came down so we climbed up the wall and pulled her and (the man) down,” a witness who calls himself ‘Bones’ told NBC10. "There was no hesitation." The friends then called 911. "Our first reaction was to run over there and see if we could help," said another man who calls himself "Reds." The woman and man were shaken but not seriously hurt, firefighters said. Baxter went missing for most of the morning but was later found hiding on the second floor of the home, NBC10's Pamela Osborne said. Members of Red Paw Emergency Relief Team climbed into the home to rescue Baxter from a second-floor bedroom. He's doing fine. The home collapse left Stephen Powers' “I Wanna Call You Names” mural that can be seen across a vacant lot from Market Street mostly gone. The rest building was torn down Wednesday after the city's Department of Licenses and Inspections deemed it unsafe. The husband, who asked not to be identified, said the home has been in his family for decades. His grandmother lived there until she moved on when she gifted it to him. The residents, who don't have homeowners insurance, have a place to stay, officials said.